Current, in-depth, and flexible, PARLONS AFFAIRES! systematically discusses French business practices and culture, while delivering a wealth of supporting material for readers. The program covers traditional business topics, as well as career practices, communication skills, and cultural concepts particular to French businesses. 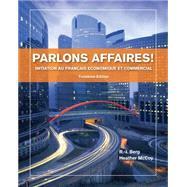 Using PARLONS AFFAIRES!, readers will acquire valuable vocabulary and insights that will improve their understanding of the French and Canadian business worlds. The clear and engaging prose of PARLONS AFFAIRES! introduces and explains the various topics of the book, while the engaging activities encourage readers to expand their comprehension of the topics and vocabulary.